Richard Garriott's rare model of Soviet rocket pioneer Konstantin Tsiolkovsky's 1903 rocket ship. The first American to follow in his father's footsteps by flying in space is auctioning some of his memorabilia, including a rare rocket ship model based on a design by Russia's "father of space travel." Richard Garriott, a famous computer game developer who in 2008 funded his own multi-million dollar launch to the International Space Station (ISS), is selling items from his eclectic collection of automobiles, automatons and space artifacts. The sale will be held this Saturday (Sept. 21) by Austin Auction Gallery in Texas. "I got it from Russia, sourced directly from descendants of the original designer," Garriott said. "Spaceflight was envisioned long ago, but if you look at fiction writers like Jules Verne, who envisioned [travelers] parachuting back to Earth, it would kill you," Garriott said. "So Tsiolkovsky, who was a grade-school math teacher in the late 1800s, was the first to show it scientifically." "He made the first practical model rocket design No. 1," explained Garriott. "He did calculations for spaceflight, and this is a model of his own original design and is the basis for how and why it works." 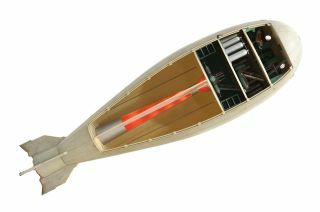 The model, which will open at the auction for a starting bid of $300, was created as a cutaway, providing a look at the command and living level, two equipment levels and the propulsion system inside. The latter even lights up. "I rewired it to 110 volt as it was originally set up [to light] on Russian power," Garriott said. Garriott has more than a passing interest in space travel; he shares his own connection to space history. Growing up watching his father Owen, a NASA astronaut, live aboard the Skylab space station and fly on the space shuttle, Garriott spent 12 days on the International Space Station as a so-called "space tourist," becoming the first second-generation American to launch into orbit. Garriott's October 2008 spaceflight was made possible by his trailblazing work in cyberspace. A pioneer in developing massively multiplayer online role-playing games, a term he coined, Garriott is also famously known as "Lord British," his character's name in the game series "Ultima" he created in the early 1980s. Garriott's professional interests have been reflected in his collection, and the pieces in turn have served as a further point of inspiration for his ongoing pursuits. "I collect and I look at these demonstration toys or things such as the model rocketship and other electromechanical items to inspire the work I do," Garriott said. "As a collector, these are personally important to me." In addition to the rare Tsiolkovsky model, the auction also offers a planetarium projector and six mechanical orreries, the latter used to illustrate the relative position and motion of the planets and moons in a heliocentric model. Outside the realm of space and astronomy items, Garriott is also selling a replica Wells Fargo stagecoach, a Harley Davidson Sportster 1200 motorcycle, 1911 Ford Tin Lizzie and 1923 Ford T-Bucket rare automobiles and a selection of automatons, including a full-size "Swami Fortune Teller" machine and a carved "Nottingham" scene showing Robin Hood shooting an arrow. The sale includes some 90 pieces from Garriott's private collection that were previously held at Britannia Manor, his Austin-area, castle-inspired home. Austin Auction Gallery has opened the sale to in-person and absentee bidders, including those who wish to participate by phone and on the internet through the gallery's website. For more information or to bid, see Austin Auction Gallery’s website at www.austinauction.com.